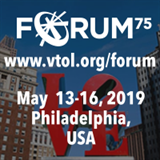 This biennial technical meeting is an excellent opportunity to learn about and discuss with academic, industry, and military engineers from around the world the latest advancements in manned/unmanned, electric/hybrid/turboshaft-powered, and civil/military autonomous VTOL aircraft technology. The Technical Meeting is being held in conjunction with the 6th Annual Electric VTOL Symposium, which will be held in parallel. The conference will feature technical paper presentation related to autonomous VTOL aircraft, while the Symposium will feature invited presentations, panel sessions and discussions on electric and hybrid electric VTOL aircraft, with a focus on urban air mobility.